You are currently browsing the tag archive for the ‘permeable surfaces’ tag. The upgrade of the front section of Sydenham Green along Unwins Bridge Road in Tempe was completed a couple of weeks ago. This park has always puzzled me in that there are relatively few trees for the space. Sydenham Green seems to have been designed with a Placemaking idea behind it as there is an obviously designated meeting place in the centre of the park. This section is quite theatrical with an amphitheatre & a great arch. There is a giant teapot, kettle & a giant lounge that offers stepped seating. I guess these represent home & pay tribute to the homes that were once here before they were demolished due to extreme noise from planes taking off & landing. Much of the artwork is painted & fired tiles made by local school children & they are great, well worth a look. I have been there a number of times & it is always empty. Maybe because it is hot. The entrance to Sydenham Green opposite the St Peters-Sydenham Library is the section of the park that was most puzzling to me. 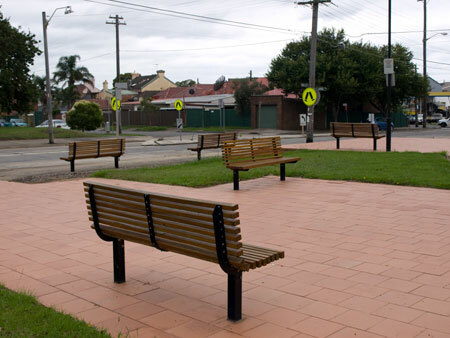 It was, until recently, a large area of grass, a couple of Gum trees & a large section of terracotta coloured pavers & grass that had benches placed in & around it. It puzzled me because I couldn’t work out why the seats had been placed in that particular way & why this layout was deemed inviting. I thought that the best things about this section of the park was a row of Callistemon that lined the front edge of the park. I also quite like the sculpture that tells of the history of Sydenham Green & I love that it has a natural birdbath carved into the sandstone. Today we went to have a look at the finished upgrade. Hmmmm. We did not think it good-looking, but this is only a matter of personal taste. Maybe plenty of other people will think it looks good. 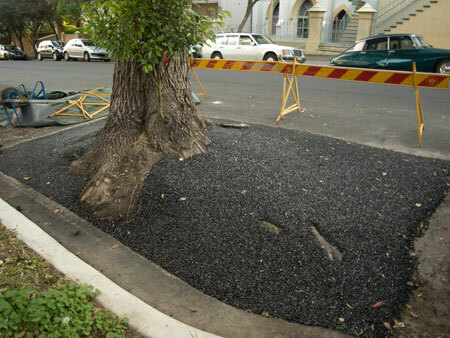 The problem I have is that Marrickville Council removed the permeable hard & soft surfaces & replaced them with hard, impermeable surfaces – concrete & black bitumen. This will make the area hotter than before & ensure that the stormwater runs off instead of the rain soaking into the ground as it did previously. Council has also removed the row of bird-feeding Callistemon replacing them with grasses, some other small growing plants & 2 Crepe myrtle trees, none of which provide food for birds. Should we care about this? I believe we should. So many food sources for urban wildlife have been removed over decades due to urbanisation. Current garden trends are removing even more. I believe that it is incumbent on Councils to ensure that they plant sufficient food sources for urban wildlife all over the place; in car parks, as street trees & especially in parks. If there are insufficient food sources our urban wildlife will slowly disappear. Most of them just can’t move to another area. Plant a couple of Grevilleas or Red Flowering Gums & watch the increase of birds. They arrive in large numbers. It’s a happy sound. An ornamental wall has been built at the front with the name of the park in silver letters. Clear, visible letters is great. 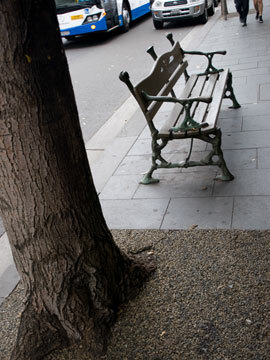 The benches are back in a new configuration & now you have to choice of facing the grass or the bitumen. 8 Crepe myrtle & 8 Lilly pilly trees have been planted. 2 Lilly pillys have already died. The trees were not planted near the benches, nor are they of a species that will create shade so the place will remain hot. Time will tell whether it remains empty. The 2 Prunus trees on the footpath have either been replaced or have come back to life after they were vandalised. The design layout is an improvement of what was previously there, but the choice of both ground surface materials & tree species fail to meet the needs of this era of climate change. I am confident in saying this because all recent literature about urban landscaping & placemaking speaks about such simple things as using albedo surfaces & planting sufficient shade-producing trees to make a cool environment that is not only useable for the community, but actually encourages them to go there. Marrickville Council has reconfigured the kerb to allow better growth for 9 mature Camphor laurel trees in Metropolitan Road Enmore. They have also put a permeable surface around the trees up to the trunk that will cope with parked cars as well as let rainwater through to the tree. Actually, the slope will discourage cars from parking next to the trunk, but if they do, no significant damage will be done. I would guess that cars have been parking next to the trunks of these trees for decades. The work done by Council not only looks good, but it also shows that older trees with significant trunks can be saved by changing the kerb, rather than chopping down the tree. I was also pleased to realize that if Marrickville Council has done all this work for Camphor laurel street trees, they must have discarded their policy of removing this species. As I have mentioned in previous posts, Camphor laurels are listed as a weed. This is true in rural areas where their seeds are spread by birds, but in urban areas, these trees can’t grow undetected. It looks like this change in policy will allow the community to continue to benefit from these large glorious lime-green shade-producing trees, many of which are feature trees in our estate houses. I am very pleased about this. Certainly Metropolitan Road looks great with its tall Camphor laurels spreading shade across the road. 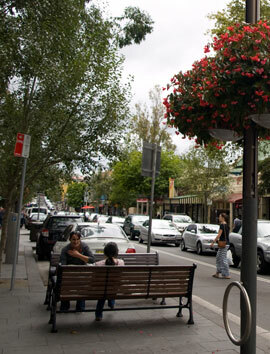 Council has planted Red Flowering Gums in the spaces between the Camphor laurels. 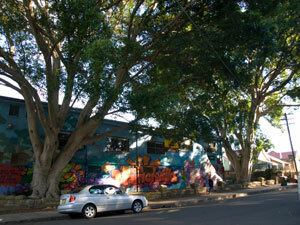 In time, this street will be filled with bold colour added to the lime-green of the Camphor laurel. It will be very beautiful. Permeable surface in Metropolitan Road Enmore. The south side of Marrickille Road was blocked for around 20 minutes. 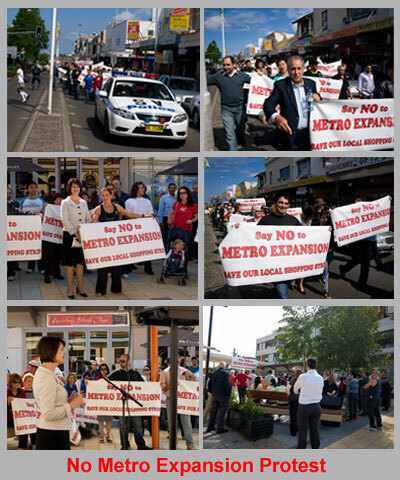 A police car escorted around 150-170 shop keepers & residents, along with Deputy Premier Carmel Tebbutt MP, Clr Morris Hanna, Clr Victor Macri, Clr Mary O’Sullivan & members of Metro Watch as they marched against the proposed Marrickville Metro expansion until they reached Alex Trevallion Plaza. Almost every marcher was holding a ‘No Marrickville Metro Expansion’ banner so any bi-standers were left with no doubt what the protest march was about. Clr Hanna addressed the crowd that had assembled in Alex Trevallion Plaza about the many negative impacts the proposed Metro expansion will have on Marrickville shopping strip. 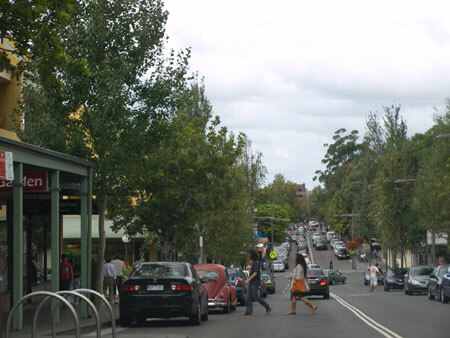 Clr Hanna also said that Marrickville Council has refused to sell Smidmore Street or the airspace to AMP Capital. He spoke about the difficulty the Marrickville shopping strip has with parking & called for something to be done about this. Carmel Tebbutt said she thought the Metro expansion was totally wrong for this area & did not support it. She also said that she had asked the NSW Planning Minister that the community can respond by way of further submissions when AMP Capital puts its next proposal in, but said he hasn’t agreed to do this as yet. She also said she was negotiating a meeting with residents & the Planning Minister to talk about their concerns regarding the proposed expansion. The crowd was big, the shops were closed, the police were out in force. It was great to see so many people participate. 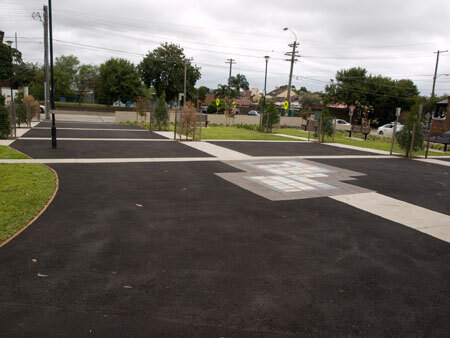 It was also nice to see Alex Trevallion Plaza used by a big crowd & to see 5 Eucalypts planted in what appears to be tree pits & with porous surface & permeable paving. The trees add a nice wall of green. I came across the google street view when searching the correct name of the Alex Trevallion Plaza. It is amazing how much better the Plaza looks now as compared with the time the google camera car drove past a few years ago. It’s a vast improvement. I downloaded the report because there was interest in the issue. The first thing that struck me was the cover page. It is a photo of the banks of the Cooks River probably taken early last century, but that’s just a guess. The environment looks unbelievably bad, not what I expected at all. I had a vision of a pristine river with natural banks & trees everywhere. Instead there is a very large denuded area about the size of Steele Park with 4 tall trees, 1 dead & another on its way out. There are around 16 newly planted saplings in the photograph with what appears to be a team of men doing some work chopping away sandstone from an area about 20 metres from the bank. The bank itself is ‘natural’ with not a mangrove to be seen. Pity copyright prevents me from including the photo. 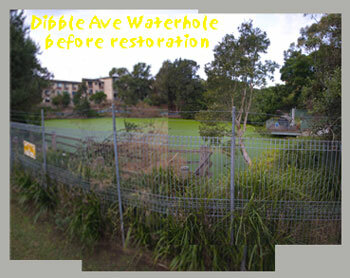 This photo shows that Marrickville Council have done enormous restoration & re-vegetation work on the Cooks River, its bank & the public space alongside the riverbank which I guess was precisely what they intended. Now wouldn’t that be amazing & something wonderful to pass on to future generations. Marrickville Council has so far created 3 Subcatchment Management Plans: Illawarra Road Subcatchment Marrickville South, Tennyson Street Subcatchment Dulwich Hill & now Riverside Crescent Subcatchment in Marrickville South. There are 21 subcatchment areas in Marrickville LGA, so it’s big job. I found the Riverside Crescent Subcatchment Management Plan exciting for a number of reasons. The goals are big, but achievable. Council intends to work with the community. 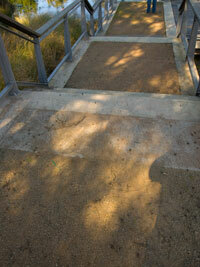 Private property issues with stormwater & the creation of permeable surfaces are also to be addressed. Council expects measurable improvement by 2019. Approximately 60% of the Riverside Catchment is impervious surface. Of that 60%, roads make up 34% with roofs, driveways & carparks making up the remaining 66%. allows water to go where it should, into the ground or into rainwater storage tanks for use in & around the home. 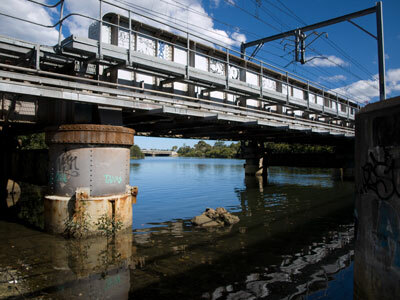 Once rainwater enters the ground, it fills the groundwater & travels through the natural causeways through the ground to reach creeks, the ocean or the Cooks River. The water is by then, cleaned of pollutants. Council isn’t kidding when they say they are going to need to co-operation of the community. Last week the Australian New Zealand Climate Forum released figures showing that Sydney is already 0.65C hotter than Newcastle. This may not seem like much, but a global temperature rise of just 2 degrees is thought to be catastrophic & result in major problems with food production, water, rising sea levels, 30% animal & plant extinction, weather patterns, floods, drought, & unsustainable living conditions for people. The heat island effect is causing the heat stored in our many hard surfaces to remain during the night & this makes for one very hot Sydney. We have already noticed significant changes over the last 3-4 years & unless we do something about this soon, Sydney is only going to get hotter. Stamped cement driveways will be a thing of the past because we will eventually choose to not live with the heat stored on our property. Hopefully Council’s Subcatchment Plan will enthuse people to remove theirs & install a permeable driveway instead. If Marrickville Council are successful in encouraging community co-operation & participation, there will be huge changes in the way the community views the environment in terms of water, trees, verges, litter & dumping. I am really happy that Council is doing this kind of work, because not only will it improve our environment in terms of general cleanliness & a cleaner river that we may one day be able to swim in, it will also increase biodiversity by offering homes & food for urban wildlife. It will also be tackling global warming & the lessening the impact of climate change. Okay, it’s a small scale, but hopefully all the Councils in Sydney & across Australia will do the same or similar & this process is repeated across the world. We have to clean up our own back yard. One very small thing we can do right now is stop buying bottled water or stop throwing plastic bottles away as litter. In all my walks along the Cooks River, the most common litter I see in the river, along the banks & in stormwater catchment drains are plastic water bottles. 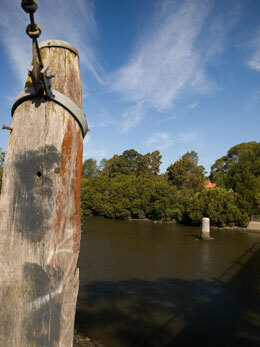 Some of them can travel to the Cooks River through the stormwater drains from as far as Newtown. 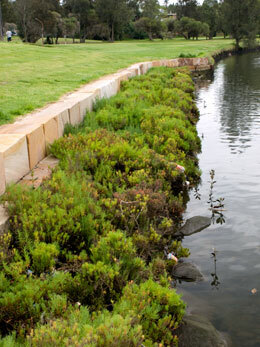 Just making a change here will lessen the pollution load in the Cooks River. It’s Marrickvlle LGA’s little piece of paradise & it can be so much better. I have found a product that could radically transform Marrickville LGA. Allow any ground surface to be permeable to water. Looks great & can be made to be invisible. The product is PermaTurf. An American company makes it, but there must be suppliers in Australia. It is a system of large sheets of interlocking cells made out of recycled plastic that can be filled with dirt & planted with grass or filled with mulch, pebbles or similar. It can also be cut to size. Imagine if Marrickville Council dug up the bitumen & concrete & covered our laneways with this product. The photos on the company’s website show seamless grass, but using grass may be unsuitable for Council as the bill for mowing is already around $2 million a year. Pea pebbles can be used instead of grass. This means that the lanes deemed unsuitable to be made into green laneways because the garbage trucks use them can also be transformed. Undoubtedly this product will be expensive. However, the cost for paving the footpath outside 8 shops is around $60,000 & it only looks good for a short while. It is soon covered with chewing gum spots. Surely this product is comparable in price & the benefits in terms of stormwater management & lowering the heat island effect has to make it worth thinking about. The suppliers say it is easy & quick to install so there won’t be any specialist installation costs. Every 1mm of rain that falls on every sq metre of roof equals 1 litre of water. The formula is 1m x 1m x 1mm = 1 litre. So for a 160sq metre roof & 5mm of rain, 800 litres of stormwater is generated from that one roof. A 250sq metre roof & 15mm rain will produce 3,750 litres of stormwater. At this stage, having rain tanks fitted to collect rainwater from roofs is not the norm. Most of the rainwater from the thousands of roofs in Marrickville LGA flows down onto hard surfaces like driveways, car parks, lanes, roads & footpaths. Very little of this rainwater is caught by gardens & verge gardens. 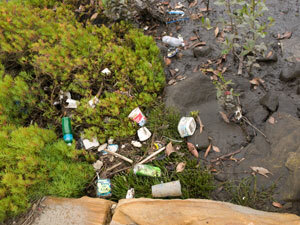 Most of it ends up in the drains & eventually into the Cooks River. 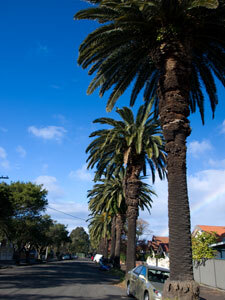 Around 85% of rainwater that falls on a typical large city will flow into stormwater drains. You don’t have to drive far in Marrickville LGA to find roads & footpaths that flood during a brief downpour because the 100 plus year old drains can’t cope. Covering our lanes with a product like this will capture millions of litres of rainwater. This water will refill the ground water, stabilize our buildings that are mostly built on clay & prevent our old drains from overflowing & stop a great deal of ground surface pollution ending up in the Cooks River. Apart from using this product to transform laneways, it is a very suitable alternative to a stamped concrete driveway. The cells can be planted with grass seeds so the driveway actually becomes hidden. If you are worried about driving on the ordinary lawn, you could plant small ornamental plants to show the edges of the driveway. The driveway can be mowed the same as the lawn. The more you concrete your property, the more you affect the ground water & the clay soil. 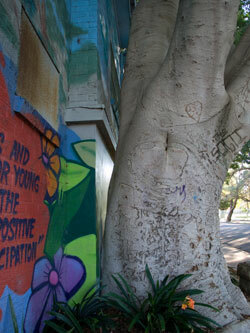 The Inner West is built predominantly on sandstone & clay soil. When clay soils dry up, they shrink & cause movement & cracking of the structure, so a permeable driveway does much to prevent this. I think it would be great if Marrickville Council could seriously look into this & other products like it to make our laneways permeable to stormwater. It’s the first step to making laneways green. 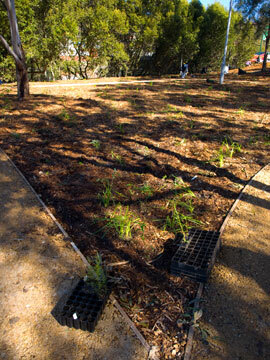 Around 85% of rainwater that falls on a typical large city will flow into stormwater drains. Our stormwater drains in Marrickville LGA are around 100 years old &, in many areas, totally incapable of managing heavy or prolonged rain. Now that more people will be moving into the area, our ancient drains are going to become a significant problem. Replacing them is a costly nightmare. By their nature cities cause stormwater problems because the majority of the surfaces are covered by concrete or bitumen. You only need to drive around Marrickville LGA when it is raining to see that the stormwater drains cannot cope when it rains. Substantial volume of water builds up along gutters. 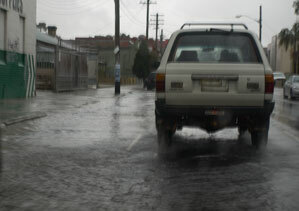 In a heavy downpour many of the streets of the Inner West become dangerously flooded. Half a road can be 30 cms deep in water. 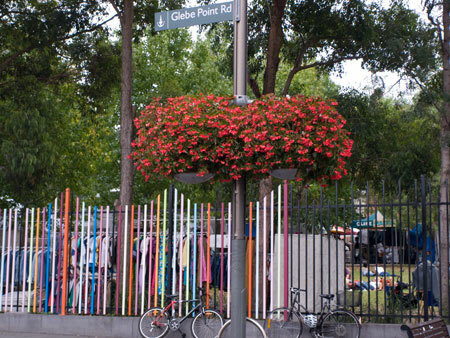 While in the short-term this is great for any nearby street trees, it is not so great for infrastructure, the Cooks River or the safety of drivers. 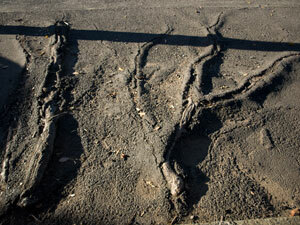 Many cities worldwide have the problem of old & inadequate stormwater drains. Some of them are tackling the problem in a simple but creative way by replacing bitumen & cement with permeable surfaces. The US city of Chicago has started a Green Alley Program. Mind you, environmental programs that address global warming & create a sustainable, more livable city, are fast making Chicago the ‘greenest’ city in the world. Chicago’s Green Alley Program established in 2007 is laying permeable surfaces in their 3,058 km (1,900 miles) of alleyways. All up this amounts to 14,163,997 sq metres (3,500 acres) of impermeable concrete in 13,000 alleys. These figures make it much easier for me to imagine the positive impact. Another issue for Chicago was untreated stormwater flowing into Lake Michigan, affecting water quality. 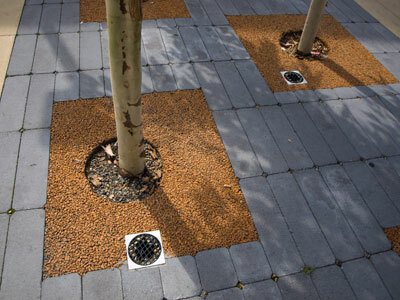 Permeable surfaces prevent around 80% of water from rushing into stormwater drains by allowing most of the rainfall to flow naturally into the ground. This is important for many reasons, including topping up the groundwater table. 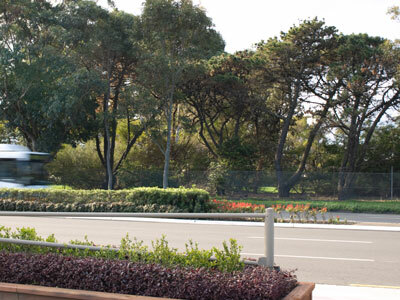 Impermeable surfaces are replaced with crushed rocks, recycled slag or recycled crushed concrete, or, with pavers designed to channel water into the ground. 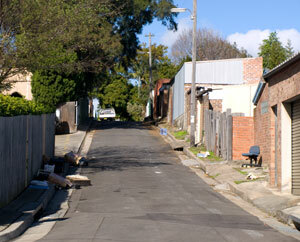 Alleys are still suitable for use by all sorts of vehicles, including bikes & by pedestrians. They won’t become muddy or trap cars in boggy ground. Additionally, the products that make permeable surfaces in the green alleys are light in colour (high albedo) with light reflecting qualities. They reflect rather than absorb sunlight, significantly lessening the Heat Island Effect. They also make dark areas brighter at night, as they reflect moonlight & potentiate any street lighting. Chicago encourages planting small bird-friendly native gardens along the edges of alleys & also encourages planting shade trees at the back of people’s property to create shade in the alley. Where it’s appropriate they install rain gardens to capture roof water from a downward pipe that would usually channel rainwater collected from the roof onto the road surface. 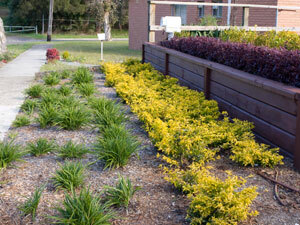 They also install water tanks & bio-swales where appropriate. Most alleys have community compost bins for everyone to use. Expensive? Well yes & no. Obviously staff time is expensive, but there are many ways to start employment programs where the costs are kept down whist giving people a chance to learn a skill. Rainwater tanks are expensive, but this could change. I imagine bio-swales are expensive to create, however a small rain garden isn’t & the plants could be grown at the community nursery. Good topsoil around the edges of alleys to encourage residents to plant the area & care for it isn’t too expensive either. Permeable surfaces in Chicago alleys were costed at around US$45/sq yard. This has got to be comparable with laying impermeable surfaces. Chicago alleys have become places where people sit in the sun (or shade) & talk with their neighbours. The alleys stop being places where potential thieves walk to case entry points. Beauty comes into what are often ugly & neglected areas full of rubbish. Back lanes are often cool places because the wind travels freely unhampered by tall walls. Imagine if they were a nice place to sit, an extension of your back garden. It’s what they do in many places overseas & have done for hundreds of years. Often new arrivals to Australia find it strange that everyone either sits inside or in their private back garden. They are used to sitting on the porch or near the street so they can say hello to everyone & greet passersby. 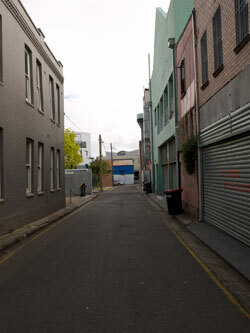 Laneways can become places like this. There is no reason why the end or the edges can’t become a community garden. This will offer urban wildlife more sources of food if any planting includes natives. I think we get conditioned to accept the status quo. 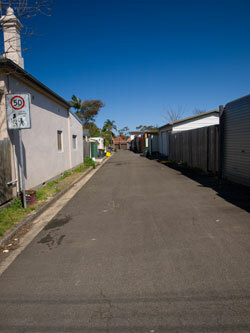 We view laneways as utility places even when the utility has stopped decades ago. We periodically clean them & store garbage bins there, except in those lanes where this has been prohibited. Graffiti artists have recognized the need for laneways to be spruced up, though their method may not be everyone’s cup of tea. 2010 recorded the hottest temperature world-wide since they started recording temperature. All the experts believe the heat will get worse which means the Heat Island Effect will get worse. We will find we are roasting in the oven we created. I think a time will come when people will willingly rip up the stamped concrete that surrounds their house because power costs to cool our homes will be very expensive & we will be forced to embrace new ways of living. Actually, they are the old ways of living before King Concrete began its reign.